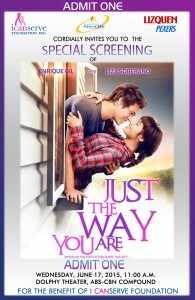 A special screening of the Star Cinema movie, Just the Way You Are, on June 17 will benefit ICanServe Foundation. The movie stars Enrique Gil and Liza Soberano, the love team that was featured in the ABS-CBN series Forevermore. Limited seats available. Call the ICanServe hotline 636 5578 for inquiries.